Compass Quotation will produce professional, comprehensive quotes for delivery of heavy materials, and has all the features you need. Designed for the unique requirements materials industry. PDF quotes can be previewed, printed or emailed as three different versions. 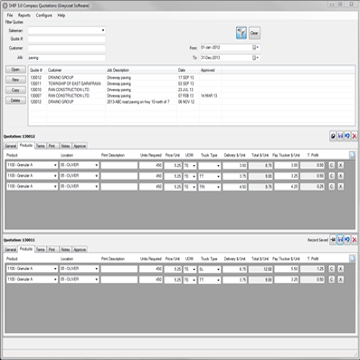 Office: All fields are displayed, including trucking profit. The legal “fine print” can be stored in templates to save typing, and modified for each quote. Quotations are listed by salesperson. Customers and quotes can be searched on any word or words in either the name or job description. From the list of matches, any quote can be opened and edited or reviewed. Lines can be copied or deleted. Copied entries can be modified. Quotes can be “pinned” in place to compare to other quotes or copy details from one quote to another. Multiple quotes can be opened simultaneously, limited only by screen size. Entire quotes can be copied. When a quote is Approved, the quote details are transferred to the Job Site file of active jobs, and prices to the Pricing files. 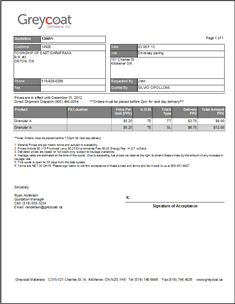 Effective dates can be applied to the price details at time of transfer to the Pricing files. A link to Google Maps is provided using the street address as a lookup. The resulting geo co-ordinates can be entered into the program for map based haulage analysis and integration with our Compass GEO module. Integration to Geocode.ca can be used for automatic lookup of lat and long based on the street address. Geocoder.ca is an optional and independent address lookup subscription service.